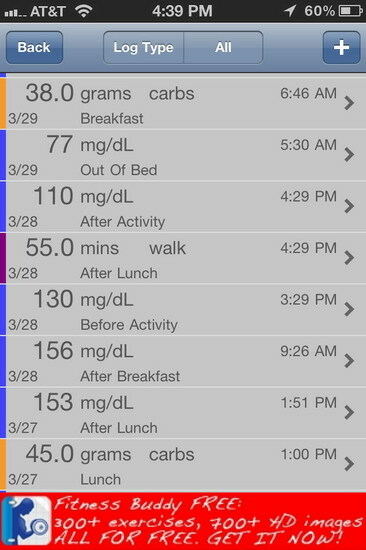 Glucose Buddy has a decent log entry system. I have found many apps that do not provide enough options to associate an entry with an event. This app allows you to assign; Out of Bed, Before Breakfast, After Breakfast, Before Lunch, After Lunch, Before Dinner, After Dinner, During Night, After Bed, Before Snack, After Snack, Before Activity, During Activity, After Activity, Other. I am not aware of an iPhone app that provides more event tagging options. A nice design feature is the use of a standard 10 digit keypad. Entering glucose, meds, activity readings and A1C levels are easy once you get your meds and activities entered. 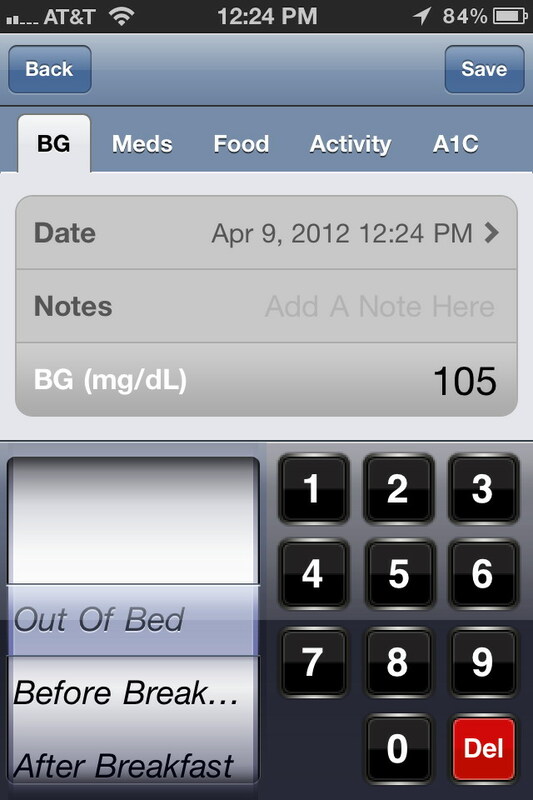 Glucose Buddy allows you to record medication usage for any medication you need to track. 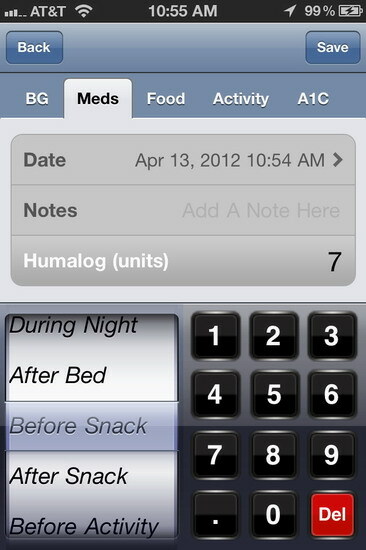 To add a single or multiple meds, you select Add Log > Meds > Select Event > Add Medicine > Select Med(s) Name> Add Log (a back button) > Select med > Enter Dosage > Save. 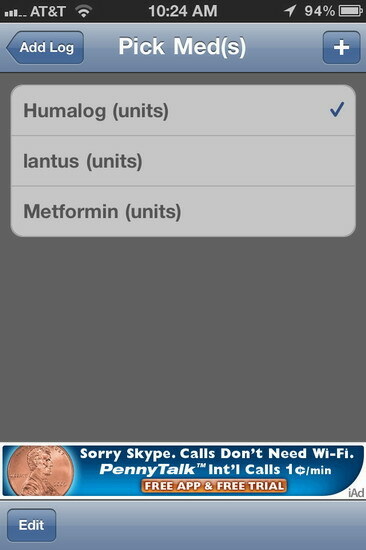 If you selected more than one med, you can enter the dosage for each med before saving the entry. 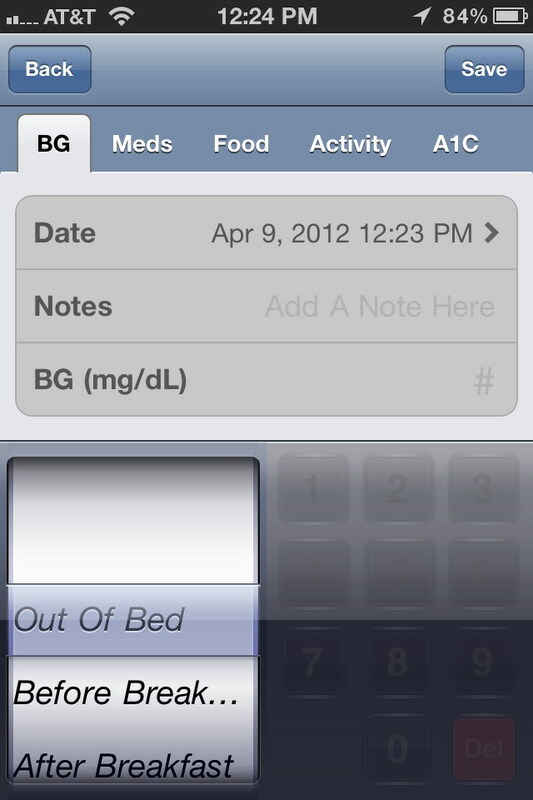 The medication select and dosage entry has 9 steps, but this part of the application works very well. One of my biggest complaints about many diabetes apps is their attempt to include a meal logging system that often becomes more of a hindrance to recording carb intake than a benefit. 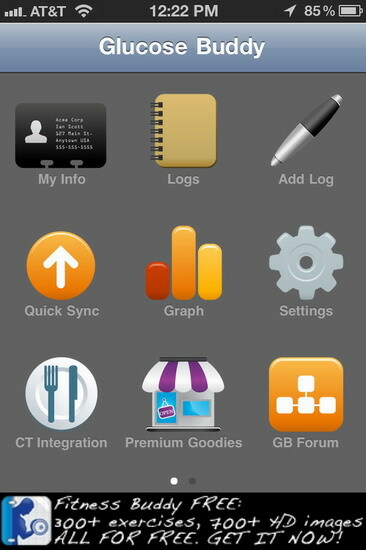 The developers of Glucose Buddy did provide a basic meal logging system that allows you to record carbs and they have integrated with a Food Logging application called CalorieTrack. This would have been a brilliant move if CalorieTrack was even remotely an application worth using. The application is only rated 2 out of 5 stars in the App Store for a reason. 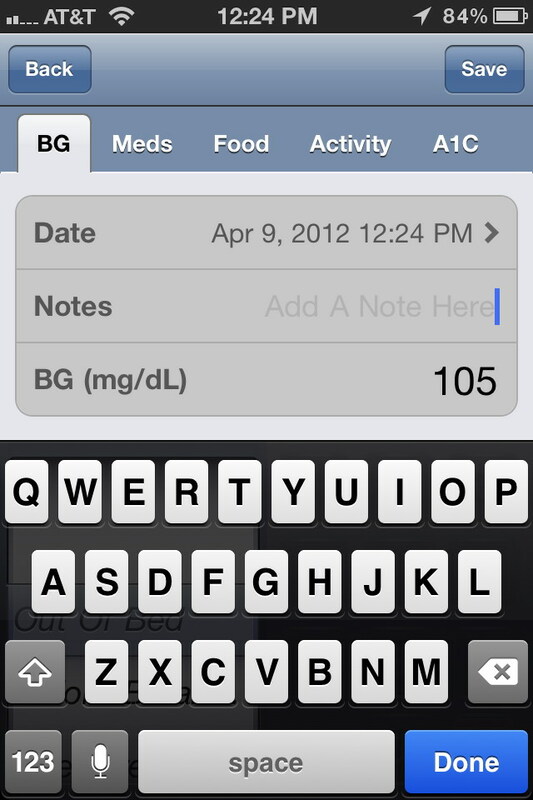 Glucose Buddy itself does not have a built-in food database. You can create a food list but you can only save the name of the food and not the carbs of that food. You must enter the carbs for a food item each time you select a food from the list. If you don’t try to enter every meal in the database and only create one food called Carb, you can easily add carbs to the log if you know the carbs in your meal.